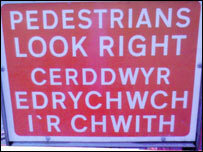 A traffic firm has apologised for a mistake on a bilingual road sign which gave conflicting advice to pedestrians. The sign was spotted by a north Wales man during a shopping trip to the centre of Cardiff. Lux Traffic Controls removed the sign as soon as they realised there was a mistake and also apologised for the "misunderstanding". Steve Williams, service manager with Lux Traffic Controls, said: "We removed the sign as soon as the mistake was pointed out to us and we will rectify it as soon as possible." "My son sent me a picture of it because it made no sense at all," said Eirwen Rowlands from Caernarfon. "I laughed when I saw it because it was so silly," added Mrs Rowlands.